I picked this book up not because I wanted to read about trees, but because I really enjoyed Preston’s debut book, The Hot Zone, about ebola. His other stuff hasn’t been as good, but I enjoyed this book — it’s about the biggest living organisms on the planet — the redwoods in California. I’ll say that I didn’t really think he could put together an entire book about trees that would keep my interest, but this book is pretty good. There’s a lot I didn’t know about the redwoods — interesting stuff. Like how about this: the tallest known trees in the world are in groves in Northern California whose location is kept a secret by the folks who study them. Or this: the very tallest tree known is about 370 feet tall (!) and growing every year. Scientists think the theoretical maximum height is about 420 feet. Or that some of these trees may predate the founding of Rome, nearly 3,000 years ago. Or that there are giant ecosystems that are at the tops of these trees that include animals found elsewhere only in the ocean. Wacky. I guess what I found most interesting is how unknown the world of trees is. As a starter, we don’t really know where the tallest tree in the world is. There’s no easy way to measure them, except by eyeballing them, climbing them, then dropping a line down and measuring it. I mean, wtf? That’s the best we can do? We live in a world where so much is known, reported, confirmed — the idea that there are things in the world that seem to be obvious & right in front of us that we don’t know at all — it’s sort of encouraging to me somehow. The idea that it’s a sort of inspired wandering around that leads to discovery — that’s a little bit how I feel about what we’re doing at Mozilla some days. The story of the folks who dedicate their lives to this is great — people climb them, camp in them, sleep at the tops of them — it’s hard to really believe, but they say that at the tops of these trees there are effectively clearings that you can walk around in, the branches are so thick — with huckleberry bushes, multiple trunks per tree — a forest at the top of each tree, really. Anyway, as a result, I think I’d like to take a family trip to see the big trees sometime. I always used to hate trips like that when I was a kid, but now it seems interesting. Kathy has always liked this stuff better than me, though, so there’s a chance Sam will like them, too. Good book. One measure of a book’s import to me is how much it changes the way I think about things & look at the world, and by that measure, it’s a great one. Saturday I started on Cormac McCarthy’s All the Pretty Horses. One of my favorite authors, but man is it a lot of work to read his writing. You just feel worn out afterwards. This one’ll take me a while, but I’ve got a backlog, so maybe I’ll post some about other books I’ve read this year in the meantime. About 20 books on my queue now. Sigh. 2 by Haruki Murakami, one of my very favorites. Gotta clear the queue before 7/21. 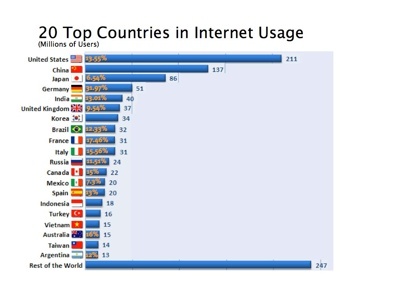 We’ve been working over the past couple of months with a some students in a Stanford class in Management Science & Engineering taught by Tom Kosnik (who I’ve known for about a million years, give or take) — looking at places in the world where Internet adoption is strong & rising, and mapping against places where Mozilla is strong. The blue lines represent Internet World’s stats on # of Internet users in each country in March; the yellow percentages on the bars represent what WebSideStory thinks is Firefox market share in each (WSS has pretty consistently been the lowest of the market share reporters on Firefox — we believe our share in most cases is one or two or more points higher — take those stats and the overall Internet population stats with a grain of salt). We know a few more things than are shown here — we think that our market share in China, for example, is a little north of 1%. In Taiwan, we believe it’s something more like 6%. Korea’s tough for historical reasons. And for us, we’ve got great strength in the 247M people who represent “Rest of the World”, in places like Poland, Finland and Eastern Europe. 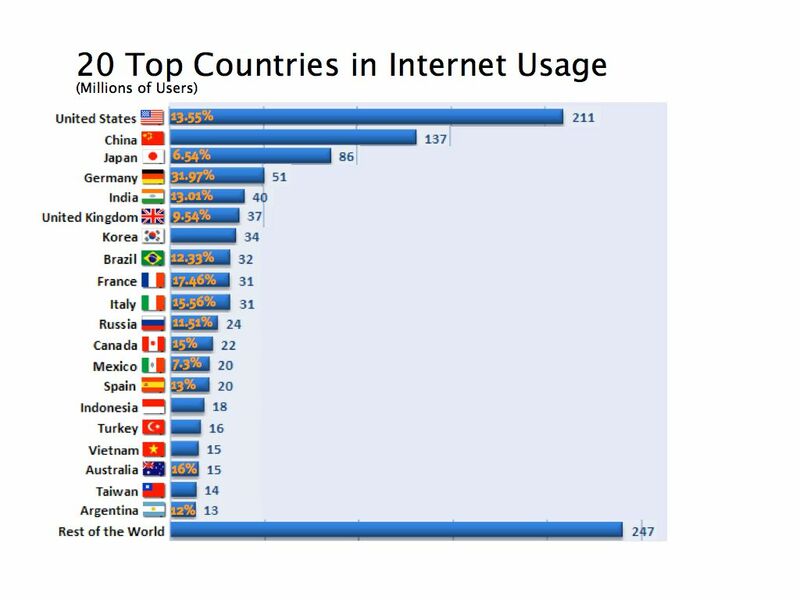 Obviously, the mass of our users still comes from the US, and that’s reflected in our own chart of usage, but I felt that this was a great visualization from the Stanford folks to highlight both how much progress a small team has done, and how much we have left to do. I’ll see if I can find some correlating numbers from other sources to give a more balanced picture in the next few days.